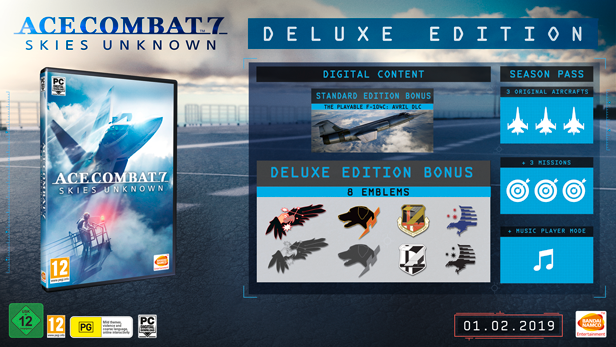 Buy Ace Combat 7 Skies Unknown now! Become an ace pilot and soar through photorealistic skies with full 360 degree movement! Aerial combat never felt better. Download Ace Combat 7 Skies Unknown for free via the Steam network. Become an ace pilot and soar through photorealistic skies with full 360 degree movement; down enemy aircraft and experience the thrill of engaging in realistic sorties! Aerial combat has never looked or felt better!Project Aces aims to revolutionize the sky with this entry in the series, offering an experience so immersive it feels like you're piloting an actual aircraft! Weather and the environment affect your aircraft and the HUD, adding a sense of extreme realism never felt before in a flight combat game. Epic dogfights await!